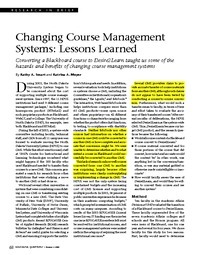 Converting a Blackboard course to Desire2Learn taught us some of the hazards and benefits of changing course management systems. Beantwortet die Frage "Wie (schlecht) funktioniert der Wechsel und die Contentübernahme von einem LCMS auf ein anderes?" an einem Beispiel. Several CMS providers claim to provide accurate transfer of course materials from another CMS, although such claims do not appear to have been tested by conducting a course-to-course conversion. Neither EduTools nor other sources had information on whether a course in one CMS could be converted to another CMS or how complete and accurate that conversion might be. We were unable to determine whether and to what extent a course in Blackboard could successfully be converted to another CMS. This lack of research on how well courses converted from one CMS to another was surprising, largely because other institutions were clearly contemplating or implementing a change in CMS.